A young engineer and his secretary awake in the ruins of a Manhattan skyscraper to discover that they've been asleep for 1,500 years. The city's architecture isn't all that's crumbled - humanity has degenerated into roving tribes of murderous, misshapen creatures. Together, the survivors of the old world must escape from New York and not only survive but also lay the foundations for a new civilization. Packed with drama, adventure, and romance, these gripping stories constitute a science-fiction classic in the tradition of H. G. Wells. Originally published as magazine serials, they first appeared in single-volume form in 1914. 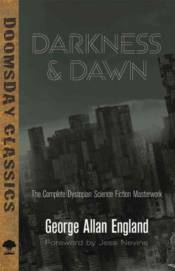 This edition presents all three of George Allan England's pioneering post-apocalyptic fables: The Vacant World, Beyond the Great Oblivion, and The Afterglow.